Let’s plant a Seed! With over 80,000 Missionaries serving in over 400 Missions around the globe the Missionaries of the Church of Jesus Christ of Latter Day Saints right now have the opportunity to share the restored gospel in so many ways. Those they teach may or may not accept the teachings at this time – but the seeds are being planted for a possible future harvest. With this box we wanted to celebrate both the seeds being planted but to also encourage our Missionaries to go out and BLOOM Where they have been Planted at this time in their missions. This box could be sent at any time of year but if you send it in the Springtime you will be able to find many items with Seeds or Flowers on them and lots of Easter items too! 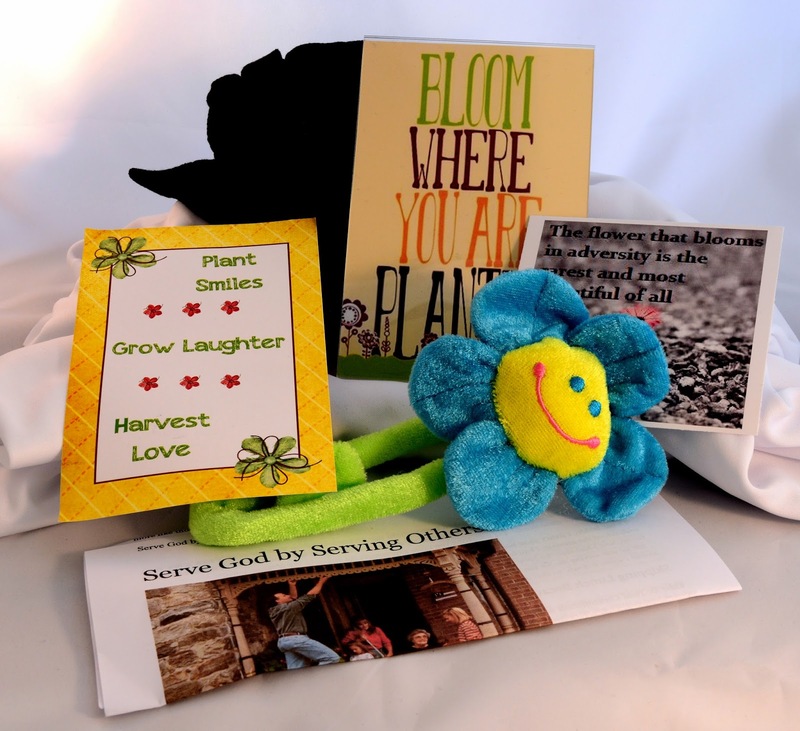 If you would like to send your own ‘Bloom Where You Are Planted’ care package to your Missionary – check out this kit we put together to help you do just that! It’s Bloomin’ Cute! For Ideas to help you put together the perfect Missionary Care Package, how you can use each Printable, to find links to print General Conference talks and other stories to include in your box – look below! Don’t Forget to BLOOM! It’s always so fun to see the pictures our Missionaries send home of them opening up their crazy boxes decorated in whatever the theme of box is. You will love it too! You’ve Got Mail! One thing we always included in all of our Missionary Box Mom boxes was a personalized letter to each Missionary from each Mother. Inside our letters we included our testimonies, the reason we chose that particular item to include in the box, along with uplifting messages filled with love. A lot of the items won’t make much sense as to why you are including them in the box unless you explain how it specifically applies to your Missionary and to Missionary work. Many times over I have received thank you letters from our Missionaries – but the things they thanked us all for the most was the letters we included. It’s just a little piece of ‘Home’ in a box! So don’t forget to write! Bloomin’ Creative!!! As we decided on each ‘Missionary Box Theme’, which we based around a scripture or missionary teaching idea, we would then brainstorm fun ideas that could be included in our box. I often wondered if our missionaries realized how comprehensive we were in our themes! It honestly might have been just as much fun for us to build these boxes as it was for them to receive them! 2. One Blank Card for the companion for each mom to sign a fun message. 3. A Teaching Tool or Object Lesson in the Bloom Where You Are Planted theme for each of our 7 Missionaries. 4. One gift for each of our 7 Missionaries in the Bloom Where You Are Planted theme. 5. An Easter gift for each of our 7 Missionaries. Each mom decided which direction they wanted to take the theme and it was so fun to see what they came up with! Honestly every item was as varied as the flowers of the earth! Husbands and wives; brothers and sisters; dads, moms and children; cousins; missionary companions; best friends and even business associates: these are all types of relationships. I have a dear friend that once told me that relationships are most important and the more you cultivate relationships the better they become. She said just like a garden it takes work to make a relationship grow and last. 29 Let no corrupt communication proceed out of your mouth, but that which is good to the use of edifying, that it may minister grace unto the hearers. 30 And grieve not the holy Spirit of God, whereby ye are sealed unto the day of redemption. 31 Let all bitterness, and wrath, and anger, and clamour, and evil speaking, be put away from you, with all malice: 32 And be ye kind one to another, tenderhearted, forgiving one another, even as God for Christ’s sake hath forgiven you. 9 Be not hasty in they spirit to be angry; for anger resteth in the bosom of fools. 7 Cursed be their anger, for it was fierce; and their wrath, for it was cruel; I will divide them in Jacob, and scatter them in Israel. Seven Conference Talks, Lessons, or Stories (Listed Below) The Links for all of these talks can be found above. I will admit that I just wanted to find a way to fit these fun soaps into one of our Missionary Boxes ~ and yes, it is a bit of a stretch to fit in with this theme ~ but Oh how fun and easy they were to make! All soap ingredients were purchased from Elements Bath and Body Supply using their Melt and Pour Soap and Alien Spaceship Molds. Liz Lemon Swindle “I would gather thee” wallet size card. “On the night before Jesus was crucified, He went to the Mount of Olives overlooking Jerusalem with His disciples. As He sat looking down on the city and people He loved, He lamented, ‘O Jerusalem, Jerusalem, thou that killest the prophets, and stonest them which are sent unto thee, how often would I have gathered thy children together, even as a hen gathereth her chickens under her wings, and ye would not!’ (Matthew 23:37). “Lord, I can’t go on,” he said. Many football games have been lost because the team with the ball has been stopped on the one-yard line. It seems that my high school team suffered more than our share of that kind of defeat. Usually we had played the entire game valiantly, only to find ourselves from one to six points behind as the final minutes of the fourth quarter ticked away. With all the spirit and enthusiasm we could muster, we would start down the field. Short gains from running plays combined with larger gains from well-executed pass plays brought us within striking distance of the goal line. Then came the plague. It was usually a do-or-die situation. A field goal would only tie the game, or we needed at least six points to win. Now the gamble. Did we go for the win, or settle for a tie? Being eternal optimists, we always went for the win. We would be on the one-yard line, with only time enough to execute one more play. The coach would give us the sign to go for the win! The snap of the ball, the crashing of pads and helmets, and the preliminary signals by our players of a touchdown were followed by disappointment when we discovered we were still on the one-yard line. I watched with sorrow and disappointment both as a young missionary and years later as a mission president when young men and young women served valiantly, only to let up at the end. In fact, we would do well to analyze and discard the phrase “the bump, the hump, the slump, and the dump.” “The bump” is the six-month mark for an elder. He has been able to rely on his trainer and senior companion to carry most of the load up to that point. He now needs to bump it in gear and start carrying his share of the load. “The hump” is the midway point. Missionary work is not new to him. He knows how to teach,contact, commit, and be successful. “The slump is where the terminology begins to break down. That is the eighteen-month mark for elders. Right when they are the most effective, some tend to go into a slump. The word itself sounds negative and defeated. The ending sounds even worse: “dump.” That sounds like something you do to garbage! I mention elders because the terminology was not common among the sisters. Being old and somewhat more focused, they seldom exhibited this syndrome. Perhaps if you need to use some words to describe your mission, you should say, “Bump, Hump, Pump, and Jump.” The first two we have already talked about. In track events, the last leg of the race is the time to really “kick.” That final burst of effort often wins the race. The runner is tired and his muscles need some rest, but the winner knows the glory is worth the sacrifice. So it is with missionary work. At the eighteen-month mark, your skills should be finely developed. If you have had to learn a foreign language, you are better than you have ever been. You are usually proficient enough in your own area that you are given the added responsibility of leadership. Perhaps the word “pump” can indicate an infusion of energy, effort, diligence, and hard work into your routine that will carry you to victory. Yes, you are tired. Missionary work is extremely demanding—physically, mentally, and spiritually. What a compliment you pay to your future spouse and children to have finished on the run the most difficult task that God has ever given his young sons and daughters to this point in your lives. You may feel that all you have left to do is “dump” at the end of your service. You will find, however, that the Lord will literally energize you in every way as you “jump” into the next exciting chapter of your life. At the end of your mission, you will look back at what you have accomplished. If you end on a high, all you see is a strong finish and the high points of your mission. On the other hand, if you finish on a slump, you will look back with regret and see all the things you wished you had done or that you wished you hadn’t! Too many times as we took missionaries to the airport for their return home, one or more of them would be in tears. Often they asked, “President, what can I do to make up for the mistakes I’ve made on my mission?” Frequently the only answer I could give was, “Well, it’s a little late to worry about that. There is your final boarding call. Now go home, pick up the pieces, and do the very best you can with the rest of your life.” My heart ached for them. Earlier efforts had been made to let them know that this day would come, and they would deeply regret the time they had wasted. Usually the warnings fell on deaf ears. They would act as if they’’ heard it all before, and they knew what they were doing. Another advantage of ending strong is momentum. The direction and the rate of improvement you establish on your mission will seldom be exceeded by what you do in the future. If you serve casually in the mission, it would take a major miracle to increase your rate of perfecting yourself once you are on your own and you no longer have the support system to help remind you of your commitment to perfection. If, on the other hand, you end strong, greatly increasing in righteousness, you will likely continue on until you reach perfection. I am confident that the leaders of the Church were young missionaries who diligently tried to serve with “all their heart, might, mind, and strength.” Join their circle by serving well. It would be less than honest to claim that sustaining a winning pace until you leave the mission field is going to be easy. On the contrary, it will be very difficult. There seems to be a build-in resistance to continued diligence. Those missionaries who are overcome with the irresistible urge to slack off claim that it is impossible to surge ahead to the very end. After serving for six months as a mission president, I asked the zone leaders to list the missionaries who had ended their mission on the run. To their surprise and my disappointment, they could only agree on one name. They all agreed that in order to do it, this young man had taken a lot of flak from the other missionaries. They had teased him, called him names, and tried to lure him off the track by using every tactic they could think of—all because he was doing what they knew they should be doing but didn’t have the dedication to do. I told them in that meeting: “Elders, this cannot be. You are better men than that. You have earned the right to be numbered among the elect who are considered potential leaders in God’s earthly kingdom. Will you renew your commitment to finish honorably?” They all consented. Six months later, I again asked the zone leaders to list those who had finished valiantly. To my satisfaction, their response was, “President, we can’t do that. It seems to us that all the missionaries are working right up to the end?” That is more what we are capable of. 15. For this people’s heart is waxed gross, and their ears are dull of hearing, and their eyes they have closed; lest at any time they should see with theireyes, and hear with their ears, and should understand with their heart, and should be converted, and I should heal them. Plastic Picture Frame 4X6 (For Idea #6) Add ‘Bloom’ print to it.